Okay, here we go. First impressions? Not another female fronted heavy metal band. Spare me. So here's Nightqueen and their debut project, drum roll please, For Queen and Metal. Even more cliche, and my interest is dwindling ... quickly. Above, Nightqueen: with heavy metal. Surprisingly (or not) this is not symphonic or gothic metal, the typical genre of female-fronted bands. 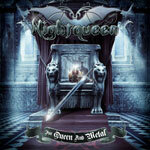 Nightqueen is classic melodic heavy and power metal. The 'queen,' in this case, is vocalist Keely Larreina. However, songwriter and guitarist Rex Zeco suggests something different, a double meaning in the band name. First, the 'queen' is the long suffering housewife who transforms into a metal mistress by night. Okay then, I got that. No, not really. Second, 'nightqueen' he says also refers to a big bat. If you say so. (Look that one up on Wikipedia.) So where are we going with this? Look at the band photo, and things soon become, well, curious or cliche. Second impression: for rudimentary and traditional melodic power metal, this is pretty good stuff. In the land of European power metal, you have to do something extraordinary to set yourself apart. Nightqueen does well, but their peers need not worry. Nightqueen is no threat to them or the power metal status quo. As for Keely Larreina's vocals, they're relatively strong, but sometimes muted by the mix. At times, she sounds like a metal Grace Slick. But, for sufficient classic melodic power metal, the music is the most convincing aspect of For Queen and Metal. The heaviness of metal is there, but also a certain epic and bombastic feel. There's lots of soaring guitar solos to boot. Top picks: Mystical Nights, metal anthem/ballad Nocturnal Thoughts, Secret of the Blend man, and the closing epic, Dark Fairy. Questionable: the title cut and Rebel to Rebel, although the latter may be the heaviest tune here. Give Nightqueen and For Queen and Metal kudos for effort, and praise for some solid melodic power metal music. But I want to hear better in the future. Give Nightqueen and For Queen and Metal kudos for effort, and praise for some solid melodic power metal. But I want to hear better in the future.